Co-founder of “Center for Propaganda and Disinformation Analysis” Foundation, columnist, journalist and commentator collaborating with Polish and Ukrainian media. Academic teacher for many years, cooperated with the Faculty of Journalism, Ivan Franko National University of Lviv, in the period 2014-2016. 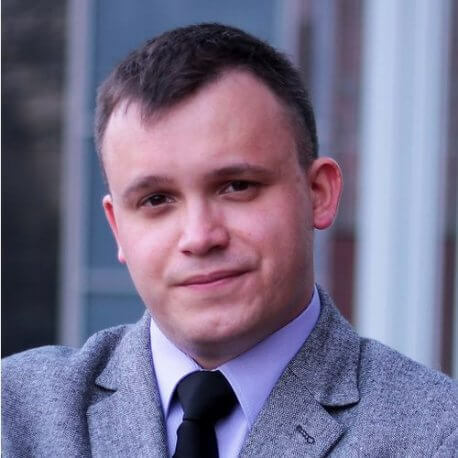 His professional experience includes also the positions fulfilled earlier: 2014-2015: analyst of Defence24.pl portal, 2016-2017: expert of “Casimir Pulaski” Foundation, and 2014-2017: member of the Management Board of “Poland-Ukraine Research Centre” Foundation, and deputy editor-in-chief of PolUkr.Net, a Polish-Ukrainian portal. He earned the Doctor of Philosophy degree in Political Science at the Institute of Political Science, Faculty of Management and Administration, Jan Kochanowski University in Kielce. He earned the Master of Arts degree at the Faculty of Applied Linguistics, University of Warsaw, and the Faculty of International Relations, College of Customs and Logistics.